The marine bacterium Streptomyces tenjimariensis is known to produce an array of primary and secondary metabolites. The mechanisms of genetic regulation and control of these metabolic production pathways have yet to be elucidated. In this study, two specific aspects of metabolism and gene expression in S. tenjimariensis were investigated: the expression of enzymes involved in the biosynthesis of aminoglycoside antibiotics and the extracellular breakdown of starch. Primers were designed to amplify DNA coding for these enzymes of interest. Sequencing of the amplified fragments confirmed the presence of the previously uncharacterized genes: 2-deoxy-scyllo-inose (DOI) synthase, L-glutamine aminotransferase (AMT), and alpha amylase. Reverse transcriptase PCR (RT-PCR) was used to analyze the mRNA expression of the selected genes in S. tenjimariensis samples grown within a controlled batch bioreactor. Gene expression was observed for the targeted genes across multiple growth points. Understanding the relationship between these biochemical pathways and cell metabolism could aid in increasing the production of known antimicrobial compounds from this species as well as potentially pave the way for future discovery of novel microbial compounds from S. tenjimariensis and other Streptomyces species. The genus Streptomyces is made up of unique Gram-positive soil bacteria with the ability to produce a diverse array of secondary metabolites such as antitumor agents, immuno-suppressants, and antibiotics (Egan et al., 2001; Bentley et al., 2002). Typically found within a highly competitive soil environment, Streptomyces are known for their capacity to metabolize a variety of carbon and nitrogen substrates. With over two thirds of naturally isolated antibiotics derived from this unique genus it makes for an interesting model for metabolic studies (Bentley et al., 2002). One member of the Streptomyces genus, S. tenjimariensis, was isolated in 1979 from mud samples in Sagami Bay, Japan (Hotta et al., 1980). S. tejimariensis is capable of producing a family of aminoglycoside antibiotics called the istamycins. Istamycins have been found to be effective against many Gram-negative and Gram-positive bacteria that are otherwise resistant to aminoglycoside antibiotics (Hotta et al., 1980). S. tenjimariensis has recently gained attention for its capacity to enhance production of istamycins when grown in the presence of other marine bacteria (Slattery, Rajbhandari et al., 2001). This link between antibiotic production and co-culture with other species indicates the presence of an externally triggered genetic regulator of antibiotic production. At present, however, only one gene from S. tenjimariensis has been sequenced (Ohta and Hasegawa, 1993). This leaves much to be uncovered regarding the genetic regulation of metabolism in S. tenjimariensis, including the utilization of complex substrates, and the production of secondary metabolites. When S. tenjimariensis was grown in a controlled batch bioreactor, distinct changes in metabolism were observed through the use of on-line bioreactor measurements, metabolic profiles, and bioactivity assays (Figure 1; Denery et al., 2005). The metabolic information and the cell samples collected from these measurements served as the basis for this present study. Specifically, two key aspects of S. tenjimariensis metabolism and gene expression were investigated: a) the expression of enzymes involved in the biosynthesis of aminoglycoside antibiotics and b) the breakdown of complex starch into more easily utilized simple carbohydrates including glucose. Figure 1. Acid and base consumption, cell mass, and bioactivity vs. time for S. tenjimariensis grown in a controlled batch bioreactor. Max dry cell weight was 5.78 g/L at 54 h.
These results indicated that bioactive compounds were being produced during the course of the bioreactor experiments (Figure 1, Bioactivity'), suggesting the possible presence of the antibiotic istamycin. Similar studies on a related aminoglycoside antibiotic producing organism- S. tenebrarius, revealed that two enzymes, 2-deoxy-scyllo-inosose (DOI) synthase and L-glutamine aminotransferase (AMT), were involved with the first two steps of aminoglycoside antibiotic biosynthesis (Kharel et al., 2004). Additionally, through the observation of a diauxic growth pattern with two separate exponential growth stages (Figure 1, Cell mass'), it was believed that the bacteria underwent a distinct metabolic shift based on carbon substrate utilization. Because S. tenjimariensis was grown in a mixture of both glucose and starch, it is possible that the bacteria grow quite quickly when glucose is in excess. However, once the available glucose is consumed, metabolic processes shift to degrade the complex carbohydrate into a simpler form. This information indicates the potential for the induced expression of an extra cellular alpha amylase enzyme once the initial glucose has been depleted. In addition to these targeted genes of interest, primers were designed for the amplification of the 16S rDNA fragment. Since 16S rDNA is known to be conserved throughout prokaryotic genomes and is integral to cell functions (Lane, 1991), it seemed an ideal candidate for use as a positive control in both PCR and in gene expression analysis. In this study, primers were designed based on published Streptomyces sequences of alpha amylase, aminoglycoside biosynthetic enzymes and 16S rDNA found in other Streptomyces using DNA isolated from S. tenjimariensis cultures grown in bioreactor liquid media. These primers were tested using the polymerase chain reaction (PCR) to determine their effectiveness in amplifying targeted DNA. Alpha amylase, DOI, AMT, and 16S rDNA products were sequenced and compared to similar published sequences in the Genbank database to determine their effectiveness in amplifying targeted DNA. RNA was extracted from each of the bioreactor samples collected at the three different stages of S. tenjimariensis growth. The isolated mRNA was transcribed into cDNA though reverse transcriptase PCR (RT-PCR) and analyzed for gene expression through gel electrophoresis. Amplified products of the predicted size suggest that specific gene expression occurred at the particular time point. The qualified genetic expression results were then correlated with changes in metabolism occurring in the bacteria during the bioreactor run. Gene specific primers targeting the amplification of alpha amylase DNA were designed based on the published sequences found in other Streptomyces including: S. livadans (Y13601) , S. venezuelae (M25263) , S. limosus(M18244) , and S. coelicolor (AL939130) (Genbank accession numbers). Alpha amylase gene sequences in these various Streptomyces species were analyzed using Vector NTI bioinformatics software (Informax, Frederick, MD). Based on conserved regions between sequences, primers were designed taking into account specific primer requirements: primers length between14-30 bp, less than 5 C melting temperature difference between forward and reverse primers, and ability to amplify fragments between 80-120 bp in length while promoting limited GC repeats and secondary structure formation. The final design for targeting alpha amylase consisted of a forward primer 5'-GTG TTG CGG AAR GCG ACC AT -3' and a reverse primer 5'-TAC GAG TTC ACC GAC CAC GAC G-3'. Deoxy-scyllo-inosose (DOI) synthase and L-glutamine aminotransferase (AMT) primers were chosen based on primers designed for S. tenebrarius (Kharel et al. 2004). Primers used were: DOI-I: 5'-ACT CSG TSC TST CSC TSA AGC AGG CS-3', DOI-II: 5'-CGT GSC CSA CSG TGT GSC CGT ACT-3', AMT-I: 5'-TSG GSG CSG GSG ACG AGG TSA TC-3' and AMT-II: 5'-TGS GCC TGS GCG CAG TCC TCG AT-3′. The 16S rDNA primers were based on a previously published primer design specifically for prokaryote 16S amplification (Lane 1991). Primers used were: 5'- AGA GTT TGA TCM TGG CTC AG-3' and 5'- GGT TAC CTT GTT ACG ACT T-3'. Primers were tested to determine their ability to amplify targeted genes though PCR. The PCR amplification condition was one cycle of denaturation at 95 &ordm;C for 4 min followed by 35 cycles of 15 sec at 95 &ordm;C for denaturation, 20 sec at 54 &ordm;C for annealing, and 32 sec at 72 &ordm;C for extension. A final extension for 7 min at 72 &ordm;C completed the procedure. As suggested by Winship (1989) and Pomp and Medrano (1991), 5% dimethyl sulfoxide (DMSO) (Sigma-Aldrich) was added to aid in amplifying CG rich regions of template. PCR products underwent gel electrophoresis on a 2% agarose gel, separating DNA fragments by size and charge. Expected products ranged from 1500 bp for 16S, 345 bp for DOI, to 264 bp for AMT, and 130 bp for alpha amylase. Products meeting expected size requirements were extracted and purified by UltraClean GelSpin Kit (MoBio, Carlsbad, CA). Purified samples were sequenced at the Greenwood Molecular Biology Facility, University of Hawaii. Sequenced PCR products were compared to nucleotide sequences (Blastn) and proteins (Blastp) published in the National Library of Medicine's BLAST database. Products with high homology to Streptomyes or other Actinomyctes species are assumed to verify that the designed primer sets can be used to identify the presence of the specific DNA of interest in S. tenjimariensis. RT-PCR (converts mRNA to cDNA before PCR) was accomplished using an OneStep RT-PCR kit (Qiagen, Valencia, CA). Extracted mRNA (~20 ng) was used from each time point. Gene-specific primers for alpha amalyse, DOI synthase, AMT aminotransferase, and 16S rDNA were used for separate reactions, testing targeted gene expression at three phases in S. tenjimariensis growth. The thermocycler was set for RT-PCR as follows: 30 min at 52 &ordm; C for reverse transcription, 15 min at 95 &ordm;C for the activation of Taq polymerase, followed by a 35 cycles starting with 30 sec at 95 &ordm;C for denaturation, 20 s at 54 &ordm;C for annealing, and 1 min at 72 &ordm;C for extension, and a final extension of 10 min at 72 &ordm;C. Control reactions, where reverse transcriptase was omitted, were run in parallel to ensure there was no DNA contamination. Positive controls were performed with genomic DNA. RT-PCR products were visualized through gel electrophoresis on a 2% agarose gel. Figure 2. PCR amplification of S. tenjimariensis DNA using designed primers. Lanes: 1, 100 bp DNA ladder; 2, DOI; 3, AMT; 4, Alpha amylase; 5, 16S rDNA. Designed primers were successful in amplifying the predicted size fragments for DOI, AMT, alpha amylase and 16S genes (Figure 2). Some non-specific binding was seen in each of the four successful PCR reactions. The 16S product (lane 2) contained a single specific band at 1500 bp, and AMT (lane 4) and DOI (lane 5) also had bright single bands at approximately 260 bp and 340 bp, respectively. In contrast, two bands of equal intensity are seen for alpha amylase (lane 3), appearing to be approximately 600 bp and 130 bp in size. When visualized on a 2% agarose gel, RT-PCR products were present at all time points for AMT, DOI, alpha amylase, and 16S (Figure 3). Looking at the DOI product approximately 340 bp long in lanes 2-4, the amount of product is much smaller than the product for AMT primers in lanes 5-7. The amount of product does not vary for DOI and AMT targets across the three multiple time points. There is expression in lanes 8 and 9 containing RNA isolated from 24 h and 36 h, respectively, using alpha amylase primers that were initially successful in amplifying a DNA product of 500 bp during primer testing. The 16S primers were tested in lanes 12-14. Lanes 13 and 14, samples 36 h and 60 h, had a greater amount of product than lane 12 at 24 h. Controls were established checking for DNA contamination by using only reverse transcriptase and universal primers (lanes 15-17) in the PCR reaction mix. Only primer dimers were present in each of these control lanes. Table 1. NCBI Blastn and Blastp search results from sequenced PCR products. Non-specific binding occurred for all designed primers (Figure 2). Non-specific binding is likely to have occurred in the amplification of each of the targeted genes because the gene sequences of interest were not yet known. Once products were sequenced and verified using the GenBank database, it was possible to use the sequence information obtained for S. tenjimariensis genes to design primers that could be more specific for the particular genes of interest. Accuracy is thus improved when primers are designed based on species specific sequence information. The sequenced DOI and AMT products matched their targeted enzymes of interest with their top three Blastp scores showing DOI synthase and AMT aminotransferase (Figure 2). S. tenebrarius was the species with the most similar sequencing match for both DOI and AMT primers, noteworthy because the primers used in this work were initially designed by researchers looking at the same genes in S. tenebrarius (Kharel et al. 2004). Both DOI and AMT have relatively low e values (7 x 10-4 and 3 x 10-3), thus showing that although the nucleic acid sequence of S. tenjimariensis is significantly different from the closest matching S. tenebrarius, it still maintains the same protein function supported by Blastp scores of 2 x 10-17 and 1 x 10-15. Alpha amylase primers were relatively non specific, amplifying two distinct bands. The larger band sequenced corresponded (Blastn and Blastp) to Streptomyces sequences for DNA topoisomerase which acts as part of a cell's replicative machinery in removing DNA supercoils. It is possible that topoisomerase along with 16S rDNA, could be used as a housekeeping or reference gene for further gene expression analysis of DOI, AMT, and alpha amylase. Figure 3. RT-PCR using extracted RNA and designed primers. 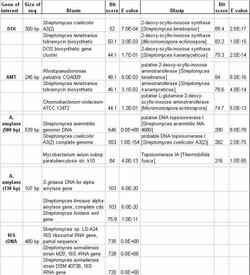 Lanes: 1 and 11, 100 bp DNA ladder; 2, DOI 24 h; 3, DOI 36 h; 4, DOI 60 h; 5, AMT 24 h; 6, AMT 36 h; 7, AMT 60 h; 8, alpha amylase 24 h; 9, alpha amylase 36 h; 10, alpha amylase 60 h; 12, 16S rDNA 24 h; 13, 16S rDNA 36 h; 14, 16S rDNA 60 h; 15, Control 24 h; 16, Control 36 h; 17, Control 60 h.
The 16S rDNA sequences had high correlation and were almost perfect matches with Streptomyces sp. LS-A24 and Streptomyces somaliensis, both having e values of zero. However since 16S rDNA is not expressed as a protein there was no Blastp score. Specific gene expression observed for DOI, AMT, alpha amylase, and 16S, indicated that gene expression was occurring at the three time points for each targeted gene. This shows the expression of aminoglycoside biosynthetic enzymes and alpha amylase within S. tenjimariensis growth through the design of gene specific primers. It is not known, however, how the levels of gene expression differ from sample to sample for a single gene of interest. It is believed that gene expression for specific genes should change over the life cycle of S. tenjimariensis. Additionally, although we can see the amount of DOI product is significantly less than any of the other three genes of interest, it is not possible to conclude the gene expression fold increase between our experimental genes (DOI, AMT, alpha amylase) and our reference gene (16S rDNA) without a more quantitative method of measuring gene expression. To gain greater insight into the levels of gene expression across multiple time points, future experiments should include real time PCR, as this method is effective in quantifying the amount mRNA present in a given sample. Other time points in S. tenjimariensis should also be analyzed so a clearer idea of gene expression is obtained. Knowing this information will provide a detailed picture of the pathways of aminoglycoside antibiotics biosynthesis and the breakdown of complex starch. In summary, without knowing the genetic makeup of S. tenjimariensis, we were able to characterize possible secondary metabolic enzymes 2-deoxy-scyllo-inosose (DOI) synthase and L-glutamine aminotransferases (AMT) as well as the catabolically active alpha amylase through the design of gene specific primers. After PCR products were confirmed from the targeted genes of interest through sequencing, it was possible to analyze genetic expression by measuring mRNA with RT-PCR. We found that S. tenjimariensis expressed all four of the genes of interest during three different phases of growth. Future work attempting to correlate relative changes in gene expression to metabolic data could also aid in describing the methods of regulation in complex biochemical pathways. A thorough understanding of the link between metabolism and gene expression in S. tenjimariensis has the potential to open doors for metabolic engineering studies as well as aid in the discovery of other novel microbial compounds.